Hirabayashi, R., Imamura, N.: 2003: Action mechanism of a selective anti-cyanobacterial compound, argimicin A.: J. Antibiotics, 56, 154-159. Imamura, N., Motoike, I., Noda, M., Adachi, K., Konno, A., Fukami, H.: 2000: Argimicin A, a novel anti-cyanobacterial compound produced by an algae-lysing bacterium. : J. Antibiotics, 53, 1317-1319. Imamura, N., Motoike, I., Shimada, N., Nishikori, M., Morisaki, H., Fukami, H.: 2001: An efficient screening approach for anti-Microcystis compounds based on knowledge of aquatic microbial ecosystem. : J. Antibiotics, 54, 582-587. Inamori, Y., Ohno, Y., Kaya, K., Watanabe, M. M., Sudo, R.: 1990: Studies on the removal and decomposition of Microcystis viridis toxic substance in the bio-film reactor. : Jpn. J. Water Poll. Res., 13, 525-530 (in Japanese with English summary). Ishitsuka, M. O., Kusumi, T., Kakisawa, H., Kaya, K., Watanabe, M. M.: 1990: Microviridin: a novel tricyclic depsipeptide from the toxic cyanobacterium Microcystis viridis. : J. Am. Chem. Soc., 112, 8180-8182. Iwami, N., Inamori, Y., Sugiura, N., Matsumura, M.: 1996: Degradation characteris-tics of toxic Microcystis viridis by Mastigophora, Monas guttula using aquatic large scale microcosm. : J. Jpn. Soc. Wat. Environ. 19, 140-146. Kaya, K., Watanabe, M. M.: 1990: Microcystin composition of an axenic clonal strain of Microcystis viridis and Microcystis viridis-containing waterblooms in Japanese freshwaters. : J. Appl. Phycol., 2, 173-178. Kusumi, T., Ooi, T., Watanabe, M. M. Takahashi, H., Kakisawa, H.: 1987: Cyanoviridin RR, a toxin from the cyanobacterium (blue-green alga) Microcystis viridis. : Tetrahedron Letters, 28, 4695-4698. 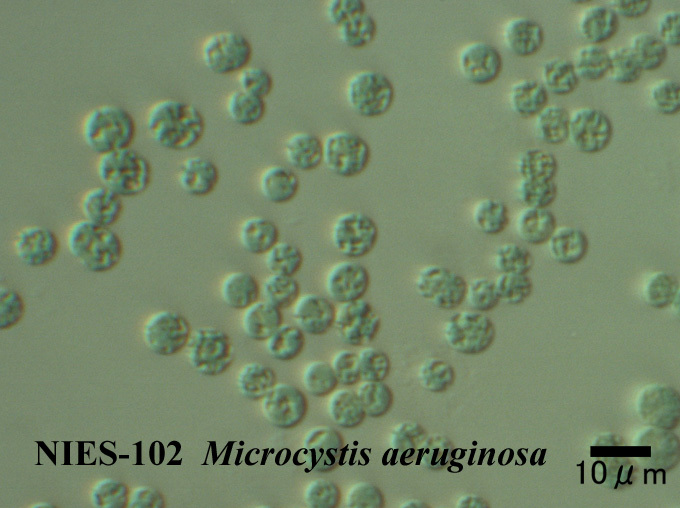 Matsuda, H., Okino, T., Murakami, M., Yamaguchi, K.: 1996: Aeruginosins 102-A and B, new thrombin inhibitors from the cyanobacterium Microcystis viridis (NIES-102). : Tetrahedron, 52, 14501-14506. Neilan, B. A., Hawkins, P. R., Cox, P. T., Goodman, A. E.: 1994: Towards a molecular taxonomy for the bloom-forming cyanobacteria. : Aust. J. Mar. Freshwater Res., 45, 869-873. Ooi, T., Kusumi, T., Kakisawa, H., Watanabe, M. M.: 1989: Structure of cyanoviridin RR, a toxin from the blue-green alga, Microcystis viridis. : J. Appl. Phycol., 1, 31-38. Sugaya, Y., Yasuno, M., Yanai, T.: 1990: Effects of toxic Microcystis viridis and isolated toxins on goldfish. : Jpn. J. Limnol., 51, 149-153. Sugiura, N., Iwami, N., Itayama, T., Inamori, Y.: 1997: Population dynamics of grazer Monas guttula and prey Microcystis viridis using aquatic large scale microcosm. : J. Jpn. Soc. Wat. Environ., 20, 332-337. Watanabe, M. M.: 1989: Toxicity of algae [Sôrui no dokusei]. : Jpn. J. Water Poll. Res., 12, 750-756 (in Japanese without English title). Watanabe, M. M., Suda, S., Kasai, F., Sawaguchi, T.: 1985: Axenic cultures of the three species of Microcystis (Cyanophyta = Cyanobacteria). : Bull. JFCC, 1, 57-63. Yamaguchi, K., Murakami, M., Okino, T.: 1989: Screening of angiotensin-converting enzyme inhibitory activities in microalgae. : J. Appl. Phycol., 1, 271-275. Yamaguchi, M., Ogawa, T., Muramoto, K., Kamio, Y., Jimbo, M., Kamiya, H.: 1999: Isolation and characterization of a mannan-binding lectin from the freshwater cyanobacterium (blue-green algae) Microcystis viridis. : Biochem. Biophys. Res. Commun., 265, 703-708. Yamaguchi, T., Kobayashi, Y., Adachi, K., Imamura, N.: 2003: Argimicins B and C, new anti-cyanobacterial compounds produced by Sphingomonas sp. M-17. : J. Antibiot., 56, 655-657. Yamamoto, Y., Suzuki, K.: 1990: Distribution and algal-lysing activity of fruiting myxobacteria in Lake Suwa. : J. Phycol., 26, 457-462. Tanabe, Y., Kaya, K., Watanabe, M. M.: 2004: Evidence for recombination in the microcystin synthetase (mcy) genes of toxic cyanobacteria Microcystis spp. : J. Mol. Evol., 58, 633-641. Kitamura, N., Nakagawa, T., Yoshida, Y., Matsushima, H., Asada, Y.: 2006: Studies on the growth control of toxic cyanobacteria by use of the water-extracts from the dead leaves of deciduous trees. : Environ. Eng. Res. [Kankyô-kôgaku Kenkyû Ronbunshû], 43, 543-549. Nakasugi, K., Alexova, R., Svenson, C. J., Neilan, B. A.: 2007: Functional Analysis of PilT from the Toxic Cyanobacterium Microcystis aeruginosa PCC 7806.: J. Bacteriol., 189, 1689-1697. Wu, Z. X., Gan, N. Q., Song, L. R.: 2007: Genetic diversity: geographical distribution and toxin profiles of Microcystis strains (cyanobacteria) in China. : J. Integr. Plant Biol., 49(3), 262-269. Ha, J. H., Hidaka, T., Tsuno, H.: 2009: Quantification of toxic Microcystis and evolution of its dominance ratio in blooms using real-time PCR. : Environ. Sci. Technol., 43, 812-818. Cadel-Six, S., Dauga, C., Castets, A. M., Rippka, R., Bouchier, C., de Marsac, N. T., Welker, M.: 2008: Halogenase genes in nonribosomal peptide synthetase gene clusters of Microcystis (Cyanobacteria): sporadic distribution and evolution. : Mol. Biol. Evol., 25, 2031-2041. Harada, K-I., Ozaki, K., Tsuzuki, S., Kato, H., Hasegawa, M., Kuroda, E. K., Arii, S., Tsuji, K. : 2009: Blue color formation of cyanobacteria with b-cyclocitral. : J. Chem. Ecol., 35, 1295-1301. Neilan, B. A., Dittmann, E., Rouhiainen, L., Bass, R. A., Schaub, V., Sivonen, K., Börner, T. : 1999: Nonribosomal peptide synthesis and toxigenicity of Cyanobacteria. : J. Bacteriol., 181, 4089-4097. Shimada, K., Kitamura, N., Yoshida, Y., Matsushima, H., Asada, Y. : 2010: Effects of water soluble extract from the dead leaves of deciduous trees on the growth control of toxic cyanobacteria like Microcystis aeruginosa. : In Water Pollution X, Eds. by Marinov, A. M. & Brebbia, C. A., WIT Press, Bucharest. p. 71-82. Kuno, S., Yoshida, T., Kamikawa, R., Hosoda, N., Sako, Y.: 2010: The distribution of a phage-related insertion sequence element in the cyanobacterium, Microcystis aeruginosa. : Microbes Environ., 25, 295-301. Yoshida, M., Yoshida, T., Satomi, M., Takashima, Y., Hosoda, N., Hiroishi, S.: 2008: Intra-specific phenotypic and genotypic variation in toxic cyanobacterial Microcystis aeruginosa. : J. Appl. Phycol., 105, 407-415. Ozaki, K., Ito, E., Tanabe, S., Natsume, K., Tsuji, K., Harada, K.: 2009: Electron microscopic study on lysis of a cyanobacterium Microcystis. : J. Health Sci., 55, 578-585. Metcalf, J. S., Bell, S. G., Codd, G. A.: 2000: Production of novel polyclonal antibodies against the cyanobacterial toxin microcystin-LR and their application for the detection and quantification of microcystins and nodularin. : Wat. Res., 34, 2761-2769. Ozaki, K., Ohta, A., Iwata, C., Horikawa, A., Tsuji, K., Ito, E., Ikai, Y., Harada, K-I. : 2008: Lysis of cyanobacteria with volatile organic compounds. : Chemosphere, 71, 1531-1538. Ziemert, N., Ishida, K., Weiz, A., Hertweck, C., Dittmann, E.: 2010: Exploiting the natural diversity of microviridin gene clusters for discovery of novel tricyclic depsipeptides. : Appl. Environ. Microbiol., 76, 3568-3574. Koskenniemi, K., Lyra, C., Rajaniemi-Wacklin, P., Jokela, J., Sivonen, K.: 2007: Quantitative real-time PCR detection of toxic Nodularia cyanobacteria in the Baltic Sea. : Appl. Environ. Microbiol., 73, 2173-2179. Takamura, Y., Yamada, T., Kimoto, A., Kanehama, N., Tanaka, T., Nakadaira, S., Yagi, O.: 2004: Growth inhibiton of Microcystis cyanobacteria by L-lysine and disappearance of natural Microcystis blooms with spraying. : Microbes Environ., 19, 31-39. Tillett, D., Neilan, B. A.: 2000: Xanthogenate nucleic acid isolation from cultured and environmental cyanobacteria. : J. Phycol., 36, 251-258. Ward, C. J., Beattie, K. A., Lee, E. Y. C., Codd, G. A.: 1997: Colorimetric protein phosphatase inhibition assay of laboratory strains and natural blooms of cyanobacteria: comparisons with high-performance liquid chromatographic analysis for microcystins. : FEMS Mircobiol. Lett., 153, 465-473. Tomita, K., Hasegawa, M., Arii, S., Tsuji, K., Bober, B., Harada, K.: 2016: Characteristic oxidation behavior of b-cyclocitral from the cyanobacterium Microcystis. : Environ. Sci. Pollut. Res., 23, 11998-12006. Lyra, C., Suomalainen, S., Gugger, M., Vezie, C., Sundman, P., Paulin, L., Sivonen, K.: 2001: Molecular characterization of planktic cyanobacteria of Anabaena, Aphanizomenon, Microcystis and Planktothrix genera. : Int. J. Syst. Evol. Microbiol., 51, 13-526. Anas, A. R. J., Nakajima, A., Naruse, C., Tone, M., Asukabe, H., Harada, K.: 2016: Determination of fVIIa-sTF inhibitors in toxic Microcystis cyanobacteria by LC-MS technique. : Mar. Drugs, 14, 7 (article ID). Imanishi, S. Y., Nakayama, T., Asukabe, H., Harada, K.: 2017: Application of MALDI Biotyper to cyanobacterial profiling. : Rapid Commun. Mass Spectrom., 31, 325-332.